Yesterday I wrote about the new vocal mics we tried out this weekend, the PR-22 and the PR-35. Today, I'll recap the instrument mics we tried out. Again, all the mics were made by Heil Sound, and as a general rule, were very good. The PR-20 is billed as a replacement to the venerable SM-58. Like all Heil mics, it's a dynamic. Like the 58, it's cardioid. We used it on the top snare. Like legions of sound guys before me, I've often used an SM-57 on top snare. It works well enough, but the PR-20 is in a different league. The sound was full-bodied and rich yet still had plenty of crack. While I wouldn't want to give up our bottom snare mic, if channel count was limited, or if my mic budget was small, this would work really well by itself. I've used the bigger brother to the 30 (PR-40) in the past, and have always been pleased. The 30 is a large diaphragm front-address dynamic. 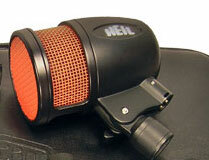 It's billed as the "ultimate guitar mic" on the Heil web site. Hyperbole? Perhaps. But it sounded really good. It's super-smooth with a response peak at about 4K that provides a nice edge to an electric guitar, helping it cut through the mix, but again, with no harshness. It also (along with the PR-40) makes an excellent studio recording mic for vocals. I used the PR-40 for doing voice-overs and was amazed. Leo Laporte of This Week in Tech is a user and a big fan of the 40, by the way. This mic is part of the Drum Mic kits that Heil offers. I don't know if it's available separately or not; it's not listed as such on their website. ** UPDATE: The PR-48 is available as a stand-alone product. Good news! Thanks to Greg from Heil for the clarification. ** We used the PR-40 on the kick at Upper Room and I really liked it. The 48 is a purpose-built Kick mic. It has a peak in the response around 60 and another one in the upper mid-range (I'm not sure where, I can't find specs online). What those peaks provide are a nice, rich kick sound that's not over-hyped at the low end, with a good amount of beater smack. We paired it with a Beta-91 inside the kick, and together they sounded great. Again, if you can use two do so. But if you only have room and budget for a single kick mic, the 48 would be a great choice. These are just some preliminary impressions. As we get more time with the mics, I'll keep writing.